Sunspot 2192: X flare seen this morning. Yes, the affected region on the Sun from this flare is a dozen times wider than our entire planet. Just a quick update: Sure enough, as predicted, the freakishly huge sunspot AR 2192 blew out a powerful X-class flare today around 14:00 UTC. The picture above shows the view from the Solar Dynamics Observatory; in the far ultraviolet it’s very sensitive to solar activity. Note the Earth for scale there, in case you need the Universe to crush your feeling of self-importance under its heel. 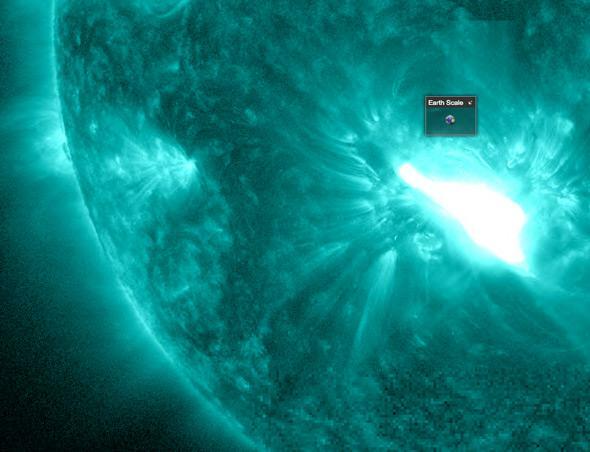 Flares are massive explosions on the Sun associated with sunspots. You can read about them in detail in an earlier post I wrote, but the quickie version is that magnetic fields in sunspots can store vast amounts of energy. Looping magnetic field lines can get tangled up and snap, releasing their energy as mind-crushing explosions called flares. They’re rated by how much X-ray energy they emit; for example M-class are “moderate”, and X-class are the highest. Today’s flare was an X 1.6, which is fairly powerful. And by “fairly,” I mean it exploded with the energy of something like a million times the combined yield of every single nuclear weapon on Earth. So yeah, bit of a big bang there. 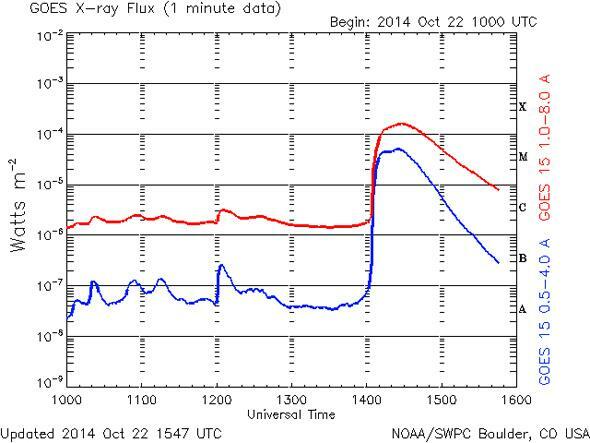 Today’s flare just topped into the X-class level, as measured by the GOES satellite. There was a smaller M flare that erupted two hours after this one, too. We’re in no danger on Earth from this flare. There are likely to be radio blackouts and minor issues like that, but that’s probably it. We may get some aurorae and such, too, so keep your eyes on SpaceWeather.com for info on that. AR 2192 is the largest sunspot complex seen in more than a decade, going back at least to when this solar magnetic cycle began. It’s been huffing and puffing, putting out a bunch of M flares, and this is the second X flare in as many days. It’s quite likely to continue this rude behavior for a while, and if there’s more news, I’ll let you know.